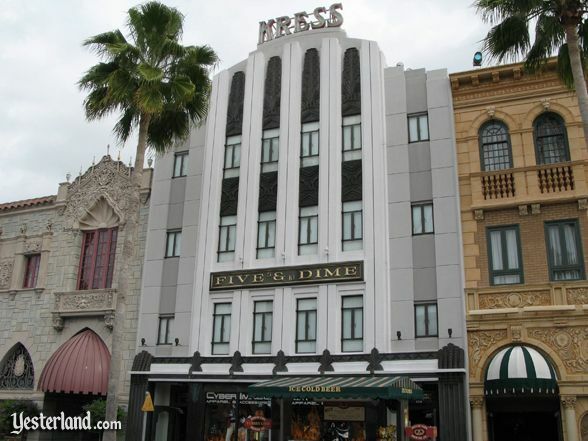 Three years ago, I began a series of articles about “Real Buildings that Inspired Disney-MGM Studios.” I followed up with “Real Buildings that Inspired Disneys California Adventure.” Universal Studios Florida also has an idealized Hollywood based on actual buildings. Some originals are long-gone, but many are still standing—and those are the ones well look at today. Designed by the architecture firm of Gogerty and Weyl, this Spanish Colonial Revival style theater has hosted many of the greatest performers of the 20th century as a live theater, nightclub, radio studio, and television studio. Originally opened in 1927 as the Hollywood Playhouse theater, it has operated under more than a half dozen names. For example, in the 1960s, is was the Jerry Lewis Theater for The Jerry Lewis Show and the Hollywood Palace and Hollywood Palace variety series, both on ABC. Today, its the Avalon Hollywood, a mega-nightclub. The Universal version does a masterful job of capturing the style of the Beverly Wilshire Hotels exterior, despite being a much smaller building. S.H. Kress & Co. was once a thriving variety store chain, with 5-10-25-Cent Stores on main streets all over America. The chains founder, Samuel H. Kress (1863–1955), took architecture seriously. His Hollywood Boulevard store (1935) was a Hollywood spectacular, designed in an Art Deco style by S.H. Kress & Co. chief architect Edward F. Sibbert. From 1949 to 2005, the building housed lingerie retailer Frederick’s of Hollywood. Within the landmark store, Frederick’s of Hollywood Lingerie Museum featured lingerie worn by celebrities in movies. The exhibit even included the bra worn by Tony Curtis in Some Like It Hot (1959). In 2008, after a multi-year restoration, the Kress name went back onto the building—but not as a sign for an S.H. Kress & Co. variety store. That chain disappeared from U.S. cities in 1981. The building is now the Kress Hollywood nightclub and restaurant. Located on the second floor of a 1922 building by architects Meyer & Holler, the Montmartre Café was a nightclub famous for its movie star clientele. Theres still a nightclub in the building, Marbella. The ground floor was originally a bank; its now Famima!! Super Convenience, an upscale convenience store featuring grab-and-go Japanese foods. The Pantages Theatre, designed by architect B. Marcus Priteca, opened in 1930 as the last movie palace built by showman Alexander Pantages. It was an Art Deco masterpiece, inside and out. For decades, it operated as a reserved-seat, roadshow movie theater. From 1949 to 1959, it also hosted the Academy Awards ceremonies, including the first televised ceremony in 1952. In 1977, the Pantages was converted into a live theater for big Broadway musicals, such as a revival of West Side Story (running November 30, 2010 - January 2, 2011). 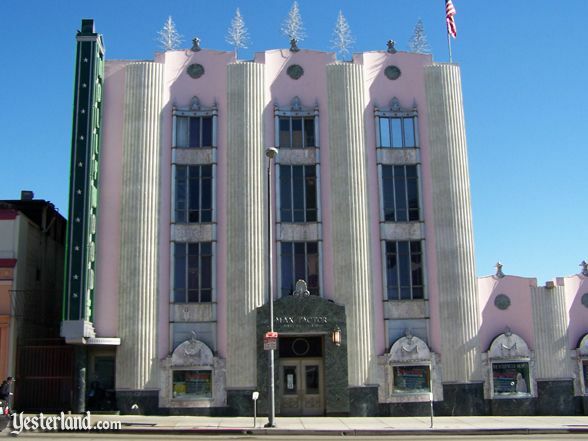 Designed by the firm of Morgan, Walls and Clements in 1925, this Churrigueresque structure served as the Hollywood Chamber of Commerce for a half century. In 1976, it became the flagship store for Schaeffer Photo and Camera Supply. Its now Larson Studios, a digital audio firm. The Darkroom at Universal and the original in Los Angeles have something in common in addition to their large “programmatic architecture” camera façades: both originally sold cameras and film, and now neither one does. For more information about the Darkroom, see the Yesterland article, Seeing Triple: The Darkroom and the Derby. This building is part of the Crossroads of the World complex, designed by Robert V. Derrah and built in 1936. Its now Eckankar, a religious organization. Another theme park building inspired by the same building is Schmoozies at Disney California Adventure. 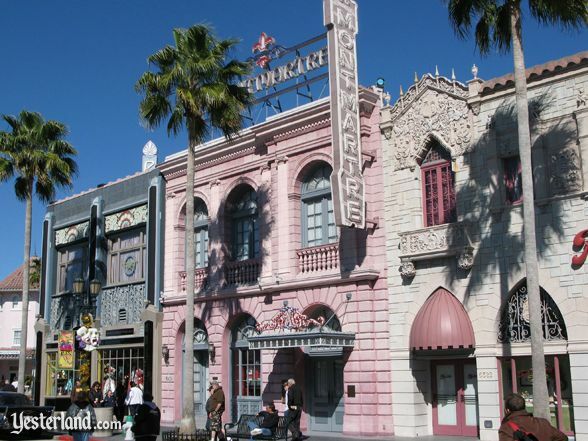 Click here to discuss this page on the Yesterland Discussion Forum at MiceChat! 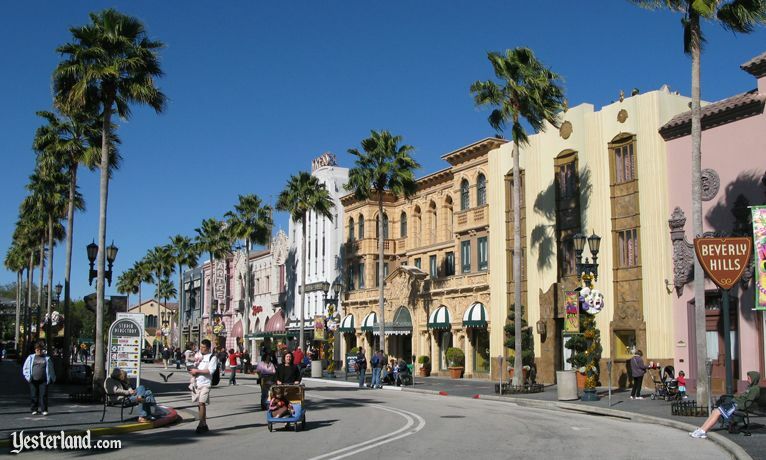 Photo of Hollywood Boulevard at Universal Studios Florida: 2009 by Werner Weiss. 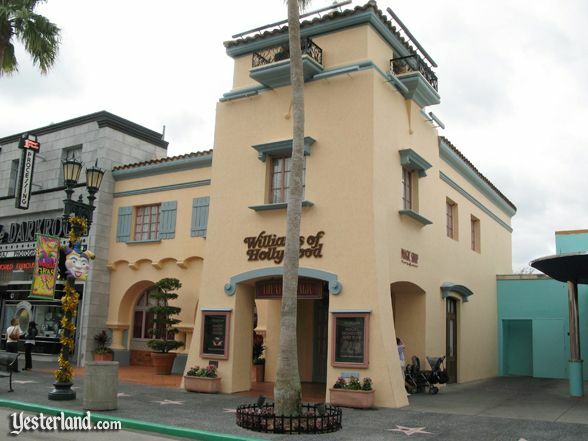 Photo of Hollywood Playhouse replica at Universal Studios Florida: 2009 by Werner Weiss. 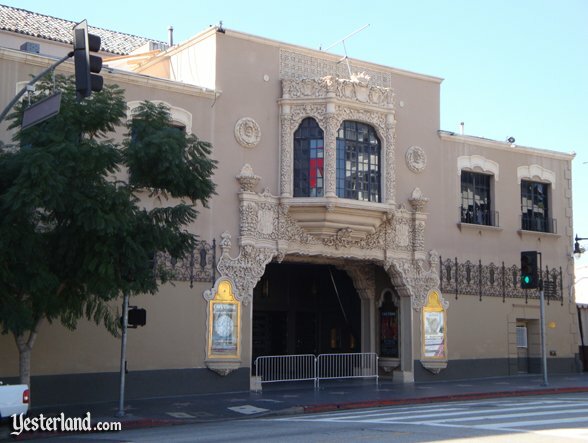 Photo of the Avalon (former Hollywood Playhouse) in Hollywood: 2010 by Chris Bales. 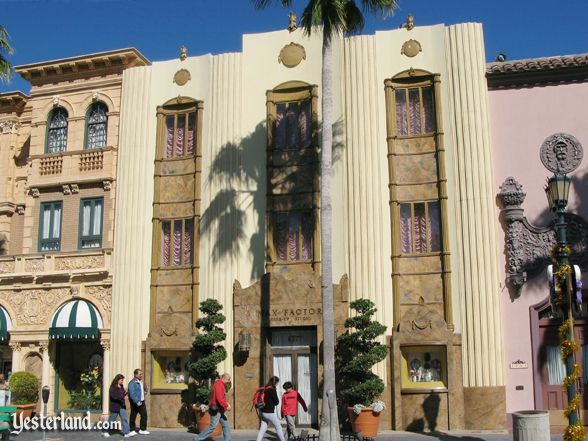 Photo of Max Factor Building replica at Universal Studios Florida: 2009 by Werner Weiss. 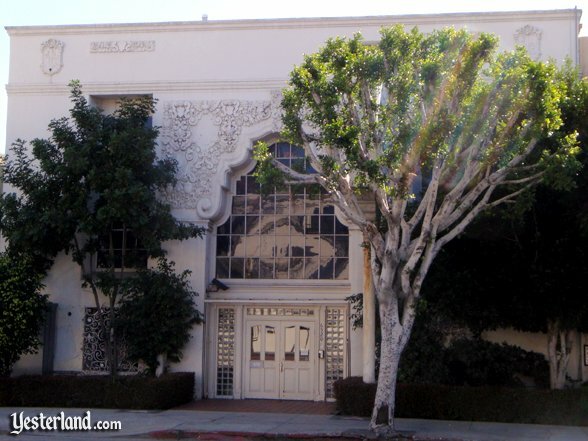 Photo of Max Factor Building in Hollywood: 2007 by Chris Bales. 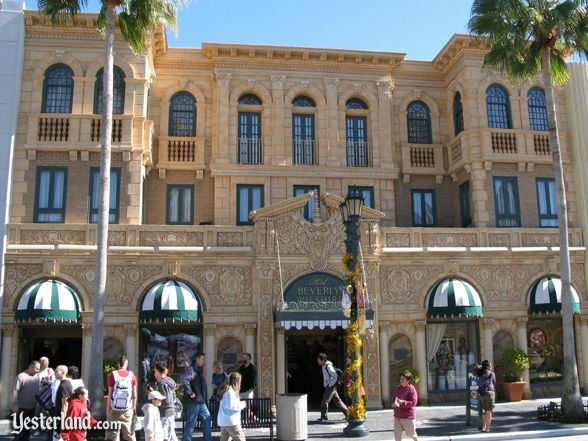 Photo of Beverly Wilshire Hotel replica at Universal Studios Florida: 2009 by Werner Weiss. 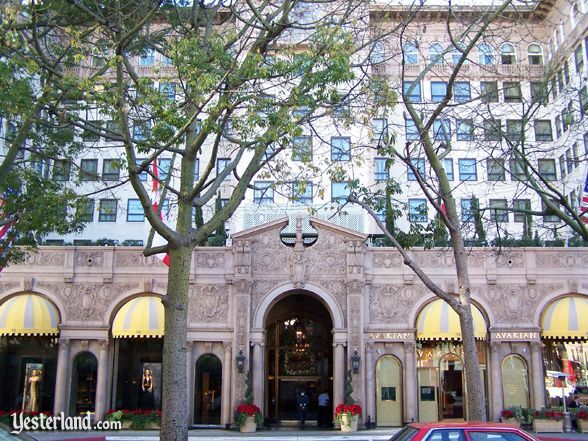 Photo of Beverly Wilshire Hotel in Beverly Hills: 2007 by Chris Bales. Photo of S.H. Kress & Co. replica at Universal Studios Florida: 2009 by Werner Weiss. 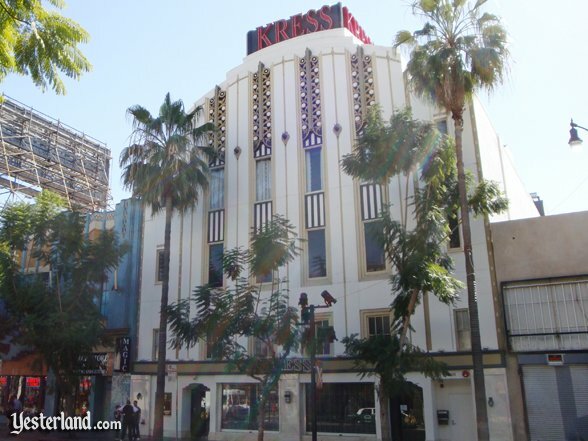 Photo of Kress Restaurant in Hollywood: 2010 by Chris Bales. 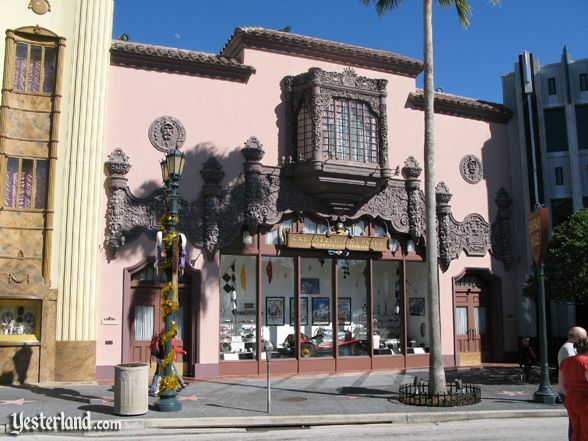 Photo of Montmartre Cafe replica at Universal Studios Florida: 2009 by Werner Weiss. 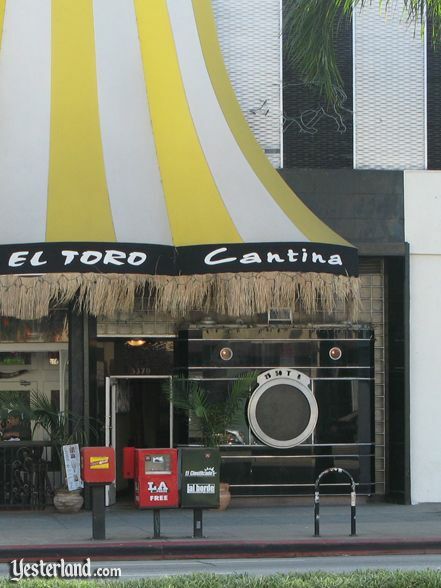 Photo of former Montmartre Cafe in Hollywood: 2010 by Chris Bales. 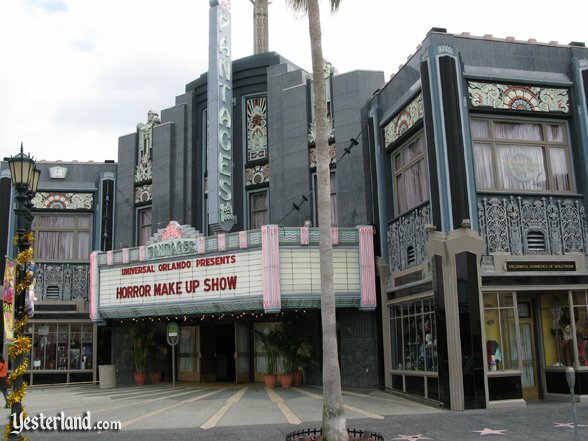 Photo of Pantages Theatre replica at Universal Studios Florida: 2009 by Werner Weiss. 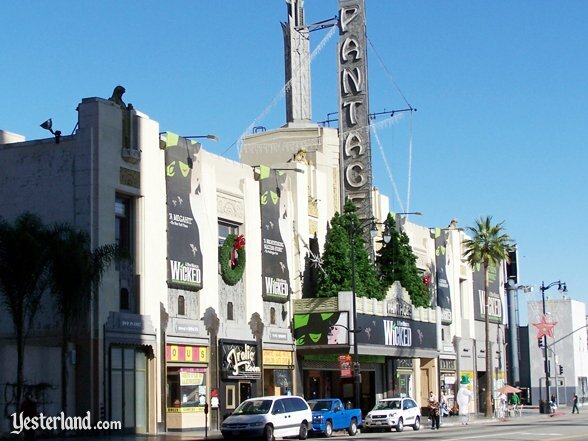 Photo of Pantages Theatre in Hollywood: 2007 by Chris Bales. 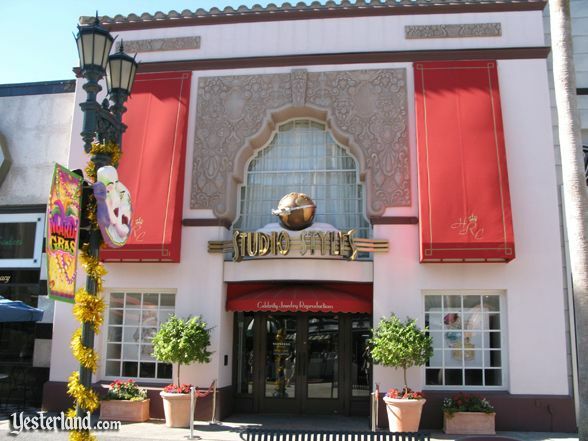 Photo of Studio Styles jewelry store at Universal Studios Florida: 2009 by Werner Weiss. 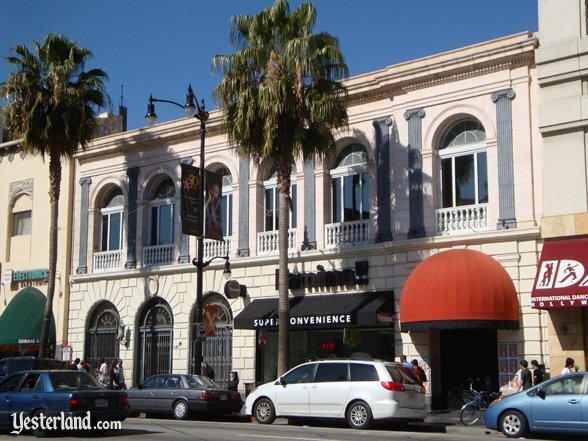 Photo of former Hollywood Chamber of Commerce in Hollywood: 2010 by Chris Bales. 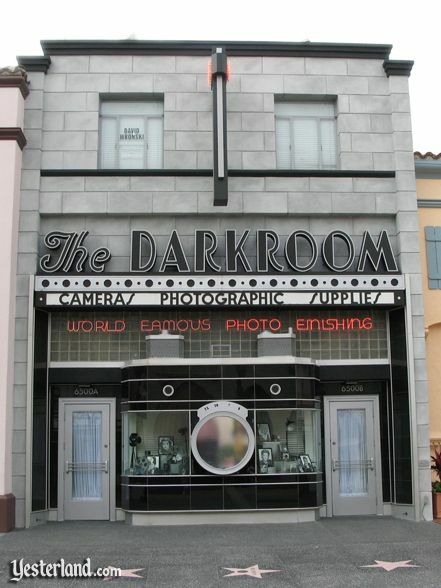 Photo of Darkroom replica at Universal Studios Florida: 2009 by Werner Weiss. Photo of former Darkroom in Los Angeles: 2007 by Werner Weiss. Photo of Williams of Hollywood at Universal Studios Florida: 2009 by Werner Weiss. Photo of Crossroads of the World in Hollywood: 2010 by Chris Bales.